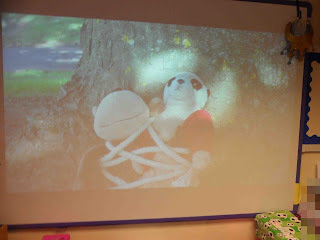 We arrived at school to find that Molly, our class mascot had been stolen by burglars. There was police tape blocking off our role play area, and muddy footprints leading to the door. Mario, the Meerkats’ mascot had also been stolen. Molly and Mario sent us a video message saying that we needed a super hero to help us. We all hope Molly comes home soon! We created our own super hero characters made some comic strip ‘action splats’ using wow words, we stuck some of these wow words up on our scrap book display.